« Phooey to Christmas, bring on Boxing Day! Tropical cyclone Oswald, with its attendant winds of 140 kph and rain that looks set to cause worse flooding in south-east Queensland than the disastrous floods of 2011 has now moved south to New South Wales. Here, in South Golden Beach, only a few miles from the Queensland border, no one goes out. The streets are empty and strewn with debris, mostly leaves and branches from trees. 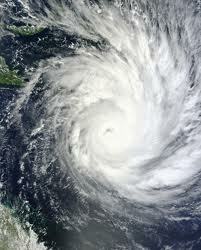 Oswald has now been officially downgraded to ex-tropical cyclone Oswald. For us, the worst of the wind was last night, and few of us got much sleep, Oswald had turned into a very unpredictable rain depression that carried within it mini-cyclones that could tear a town apart as one did yesterday in Bargara, a seaside township near Bundaberg. Still, now at 2 p.m. it seems that we are over the worst. Wind gusts are down to around 70 kph and are predicted to drop further in the late evening. Oswald is slated to arrive in Sydney in the early hours of tomorrow morning, bringing with it the kind of torrential rain that has already flooded the CBDs of towns in south-east Queensland and is going to flood the capital city of Brisbane once more. The people in this area are exhausted: they barely survived the 2011 floods in which lives were lost and many homes were flooded to the rooftops. Most had just finished rebuilding or renovating; now, they must go through it all again. In some towns, the flood heights are predicted to be higher than in 2011. So we are lucky. So far, there have been not even been any power cuts, though most are well prepared with water, matches, torches, candles, food and gas burners. Floods are not such a problem here. In fourteen years of living in South Golden Beach, the closest I’ve ever come to being flooded was on 30 June 2005, when the water reached to within six inches of the floorboards. Here, being so close to the coast, the biggest danger the village faces is from wind. There’s always the possibility that some cyclone with nothing better to do will wander in from the sea and wipe us out the way Cyclone Zoe did the little hamlet of Sheltering Palms four miles to the south of us, in 1974. And so we count our blessings. We are overdue for a really bad cyclone. Fortunately, this wasn’t the one. Our thoughts are with all the poor souls who have to suffer through this again. Thankfully we’re sheltered from the worst of the winds. Still, we’ve been watching our palms and trees, hoping they’ll keep their crowns and only look tatty once Oswald is done and dusted. A gust of wind nabbed the rubber dinghy the kids use to play with in the pool. It sailed in to the air, landing in the dam, which is overflowing. We are cut off, but that’s okay. Life slows down, which is good. There no excuse needed to settle in a comfy chair with a book while the weather howls around outside. Yes, I thought of you when it was all happening; I knew you’d be sheltered from most of the wind, and that you’d be cut off by the creek, at least for a few hours. As you say, it’s kind of nice it you’ve got enough human and pet food. However, I don’t like high winds. The sea came up over the dunes at the point behind the community hall. If the tide had been 2.2 m, instead of the 1.7 it was, the waves would’ve washed completely over, and run down into the streets. South Golden Beach is a village waiting to be swept away. Thanks Danny. We are indeed blessed. Wishing all others safety during this turbulent weather. Indeed, Odette, I feel very sorry for the people in south-east Queensland. I was raised in Brisbane and, apart from the floods of 1974, I don’t ever recall Queensland having such flooding as it’s been experiencing these past few years.